Microsoft reportedly is quietly testing a new social network, called Socl.com. 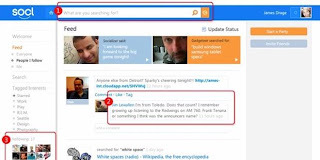 It looks like Microsoft will make social networking similar to Google. Microsoft's secret project was first detected in July, when they are testing the website to get online, then info is exposed to the public, and ultimately could be accessed for some time. The project, called the Tulip, has the slogan "Find what you need and share what you know Easier than ever". As quoted from The Verge, according to its slogan, Socl a blend of search, adventure, and social. Socl have a design with a standard three-column layout, with main navigation on the left side, the flow of news / updates in the middle, and a collection of some of the features on the right. Column for the search located at the very top, the search engine of course it uses Bing from Microsoft. Each time a user searches with certain keywords, Bing will give results that are relevant to the activity of the owner of the account. Socl has the feature "Video Party" which is similar to video conferencing feature found in Google, Google Hangouts. With "Video Party", users can have conversations via video with several other users at a time. "candidate" is Microsoft's social networking users can register using your Facebook account or Twitter. Although Microsoft denied the existence of the secret project, it seems they still continue to work on developing Socl. Domain www.socl.com currently can not be accessed again, this is the last display before the website closed.